Last night the worship guild of the gathering ‘met’. This is an open group of people that get together to think about and plan the main monthly gathering. Last night’s topic was ‘ancient roots’. 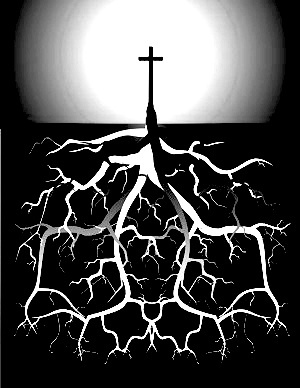 We speak of the gathering as ‘an ancient future church seeking to travel Christian faith together’ and so when we were planning topics earlier in the year someone thought we ought to explore those ‘ancient roots’ together. Last night we chatted a lot about practices that have helped Christian communities through the ages and then thought about how we might experience then as the gathering. The result will be a slightly different gathering again on June 12th as we seek to ‘try out’ some ancient practices. Some of these will be experienced as a group, while others will be experienced privately. As always, we will be giving everyone who wishes to the opportunity to contribute what they wish to contribute. So … why not come along and try the examen, or spend some time using Lectio Divina, be surprised in what you hear God say through current chart music or even experience the joy of creating something new. June 12th. 4.15pm in the crypt at Rochester Cathedral …. maybe see you there!